The Chaplaincy at The John Henry Newman School is at the centre of the school community and offers support and nurturing to pupils, students and staff in their mission to become the person God created them to be. Both our ordained and lay chaplain, together with our student led "C-Teams", work together to build Christ's kingdom in our very own school community. Our students have an integral role to play in the preparation, participation and evaluation of Masses, liturgical worship, services of reconciliation, retreats and acts of prayer and reflection. Through music, readings, liturgical dance and reflection, pupils and students are at the centre of every worship opportunity and we hope to continue the tradition of commissioning more Eucharistic ministers from our student body this year. Our student C-Teams are proud, proactive and committed to making small acts with great love to change the world, and with over 100 pupils and students attending our September 2018 launch, ideas are already being shared and developed to living out the example of Christ in both our school, local and overseas communities. In the midst of the busy school day you will find two areas of sanctuary for all pupils, students and staff. Firstly our Chapel, open every day for all to visit. 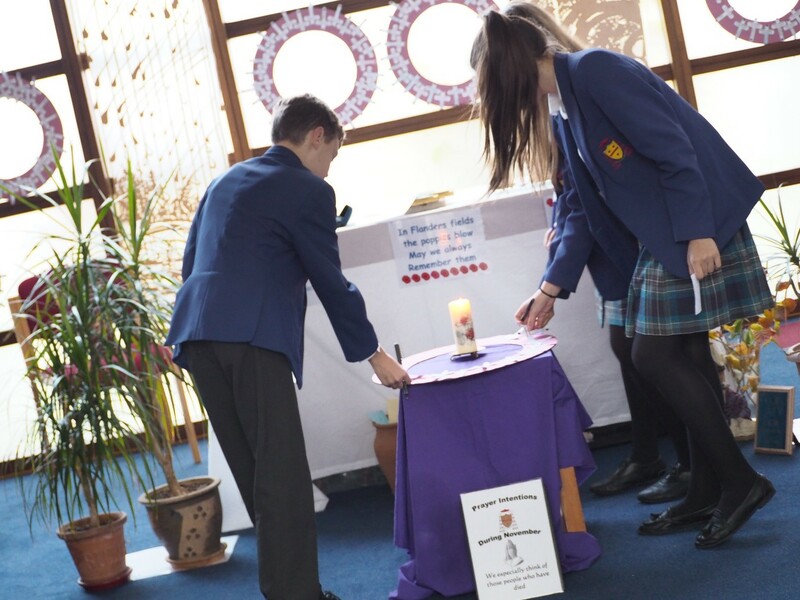 Frequently booked by individual classes and tutors, years 7 and 8 have a chapel lesson every year and opportunities for reconciliation are offered during Advent and Lent. Our priest chaplain, Fr Philip Law, invites the whole community to Holy Hour, over Friday lunchtime and staff prayer on a Thursday morning is a welcome time of peace and reflection in the middle of the busy week. The second is our recently established Peace Garden. Opened and blessed by Bishop Paul last year, it offers a place of rest, stillness and sanctuary at the heart of our vibrant community. Moments of stillness can also be found elsewhere in the school. Daily prayer is shared every morning in tutor groups and year group Masses are scheduled in throughout the year. We are fortunate to be supported by our Deanery priests, one each being assigned to every year group, who frequently visit, celebrate Mass with their assigned year and support the Pastoral teams across the school. To keep up to date with the work of the Chaplaincy, the C-Teams and for all recent liturgical celebration, fundraising and campaigning news please see the weekly section of the Headteacher's newsletter. Please see here for the Prayer Resources this week. Over 100 pupils and students gathered for the C Team launch on Wednesday 19th October. Together they discussed ideas on how they could make a difference to the Liturgical life of the school as well as ways to spread love and make a difference within and beyond the JHN community. In preparation for our Feast day celebrations 2017, each year group covered an aspect of Catholic School Teaching. Built around the Mass theme of ‘Who is my neighbour’ we collected paper-chain people based on the reflections of our community. One outcome of this was that a sixth form student who wanted to explore the meaning of community, encouraged us to create pen pal links with our friends in the KiSS community in Uganga. This in turn, formed part of our annual ‘KiSS week’celebrations. She was moved when Julius (who oversees KiSS in Uganda) gifted the school with a painting that the KiSS children had made, and she thought it would be nice and equally moving for us to give them something as a token of our thanks in return. Being so closely involved with KiSS and with the wide range of charities we support has definitely enriched our school community as our pupils come to understand the Gospel call to serve others and change the world. In preparation of our anniversary Feast Day in 2018, a group of students and staff visited the International Centre of Newman Friends at Littlemore, Oxford. This is where John Henry Newman lived and was received fully into the Catholic church. The pupils and students listened to a talk on the life of John Henry Newman, toured where he spent a lot of his time in prayer, learned about his extensive letters and they also began planning how we will be celebrating our feast day this year. For our Year 7’s, a new school means new friends. Just a few weeks into the new academic year, we organise for them to have an opportunity off- site, where they can explore the scriptures and the advice it offers on friendship, led by Sixth Form volunteers. They enjoy a carousel of five different activities and this year it included exploring their form patron saints with arts and crafts, alongside the team building activities by building a tower with groceries, exploring what it takes to be a ‘super’hero and dramatizing moral decisions. They also received an introduction to the KiSS charity by our Head Boy & Head Girl team who lead the KiSS fundraising initiatives for the student body. Last year the nearby Coptic cathedral helped Stevenage make national press by joining in with raising awareness of #RedWednesday - a day when up and down the country, communities come together to raise awareness of the plight of people who are not able to practice their religion freely and are even persecuted for their faith. They did this by lighting up their cathedral with red lights, as happened at Westminster Cathedral. This gave us the inspiration to explore this topic with our Year 9 & 10 C-team, who came together in the chapel to hold our brothers and sisters in prayer as we too lit up in red. For our annual remembrance service we were joined by the Town Mayor and her consort, as well as our own Youth Mayor, veterans and the nephew of one of the alumni of the St. Michael’s School who lost his life in out in the war. We dedicated a plaque of remembrance to him and the other alumni of St Michael's, St Angela's and John Henry Newman on the new Pavilion building. Sixth formers and pupils led the services with the great grandsons of the St. Micheal’s alumni, sending of a balloon for all the men names on the plaque. Throughout the month of November, pupils joined us in the Chapel to create wreathes of crosses with prayers for those whom they would like to remember. A huge thank you to everyone who contributed to the Advent food bank Appeal, supporting The Trussel Trust, the network that serves our local area. The picture below shows just a portion of the donations we gathered for collection, as well as items that were delivered to the Justice and Peace commission, supporting the young refugees suffering in the blistering winter conditions in the forrest camps of Calais. Many students presented the back story and work of the Trussel Trust to their forms. On the day of our annual Christmas lunch, pupils had the opportunity to wear their Christmas jumpers and donate to our chosen local charity ‘Herts Young Homeless’. They have since been back to give us a very interesting talk that was also co-presented by a past service user who is now one of their volunteers. This gave us an insight into how the funds we raised are used to help young people without a permanent roof over their heads. Our Music students entertaining patients on the wards of Lister Hospital, only up the road from where they can be found carol singing at Sainsbury’s to fundraise for KiSS during advent! At the end of the Advent services Years 8-13 had the opportunity to spend time with the concelebrating priests to receive the sacrament of reconcilliation. Our reflections during the service tied closely into this - for example the interpretation of God's grace through dance was prepared and performed by a number of our Year 8 pupils. Year 7 pupils are given the opportunity throughout the year to meet a priest during school time. Throughout the course of Advent, Year 7 also focused reflections on our wasteful society habits. This culminated in a competiton for the most innovative nativity scene, enabling groups of pupils to work together to create an up-cycled nativity scene made out of recycled materials. On Holocaust Memorial Day we were invited to attend the Dame Alice Owens School for the county wide event remembering the victims of genocides. This included the Rwandan genocide, and 2 of our Sixth form students, Hope Holliday and Sean McCann, presented a moving account regarding one of the members of our KiSS community who had to flee to Uganda as a result of genocide in their native country. Hope and Sean then had the opportunity to join the other speakers on a day to visit the infamous the Nazi Camp, Auschwitz, in Poland. On their return they shared their experience as part of our Lent service. 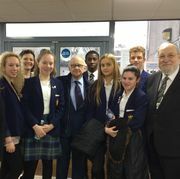 On Holocaust Memorial Day, we had the privilege of listening to Izzy, a holocaust survivor, (pictured centre) and shared his inspiring life story and wisdom, including his relationship with God. This year, as in the past, we collaborated with Nicholas Brakespear School on a joint staff INSET day. We were fortunate to have the chance to listen to inspiring guest speakers, as well as be in great company with our priest chaplains who serve both schools. We welcomed Bishop Paul McAleenan who attended and concelebrated Mass with us. Throughout the year, we work hard to maintain our close, strong relationships with pupils from our feeder primary schools. They are invited to many of our school events, attending the matinee performance of our school productions and our community mass. During their visit at Christmas, the Head Boy Head Girl team were really inspired by how the young people of the KiSS community would teach the little children games and dances and pass down their culture to future generations. On their return to school, our students undertook to teach a dance that the Head Boy/Head Girl team learned on their KiSS community visit, to a group from St Vincent De Paul school. The pupils of St Vincent De Paul school enthusiastically took part in the ‘You are KiSS’ night as part of our KiSS week events, and performed it to the community. The whole school assembly prayer focus also enjoyed a Ugandan inspired makeover for ‘wear Uganda’s colours’ day when pupils could wear items of clothes that were red yellow and black, with many pupils opting to wear some of the Ugandan national dress bought over from the Christmas visit! Year 9’s are covering Judaism as part of their curriculum in RE and we were kindly hosted by the Missouri synagogue in St Albans for a few afternoons so that all the groups could visit and learn. This was a really interesting opportunity to understand the basis of the traditions of our Church.